July 20 is International Chess Day. Chess is practically the only sport in which Russia has managed to preserve its leadership since the breakup of the Soviet Union. Although public interest in chess has waned in recent years, chess players and officials are trying to change the situation. In more than 100 years since the first world chess championship, only 16 people in the world have held the lofty title of world champion. Seven of those were trained by the Soviet school of chess, and three are graduates of modern Russian chess. Out of the numerous sports which the USSR enjoyed dominance, chess is probably the only one in which Russia, according to FIDE ratings, has managed to retain a leading position since the collapse of the Soviet Union. For example, in the July list of the world's top 100 chess players, Russia's Alexander Grischuk is a confident number three. Only slightly behind him, in sixth place, is Sergey Karjakin (born in 1990), who 12 years ago was entered in the Guinness Book of Records as the youngest grandmaster ever. Number eight on the list is Vladimir Kramnik, a world chess champion with a 20-year-old career, famous since Soviet times. Kirill Zangalis, PR director of the Russian Chess Federation, in an interview with RBTH, stressed that Russia has not lost its preeminence in chess: "The top 100 names on the world rating include quite a few players from the former Soviet Union,” he said. “True, Western schools have become stronger, as testified by the emergence of India's Viswanathan Anand and Magnus Carlsen of Norway (who is the reigning champion). However, out of the world's top 20 grand masters, seven are from Russia." In the USSR, the famous line by Bolshevik revolution leader Vladimir Lenin that "chess is mental gymnastics" became a socialist propaganda slogan. Playing chess was considered to be a fashionable and prestigious thing to do, and outstanding Soviet players were household names and commanded great respect. Famous chess players, like Mikhail Tal, enjoyed nearly the same pin-up kudos with young people as the first man in space, Yuri Gagarin. The Soviet Union's achievements in chess were presented as evidence of the superiority of the socialist system over the capitalist West. Yet these days, few Russians would be able to name the Russian chess players who perform in international tournaments and win top places there. According to a poll conducted by the Public Opinion Foundation (FOM) in July 2013, only 2 percent of Russians said they were interested in chess. None of the respondents was able to name any popular Russian chess players. The poll was conducted at the time of the 2013 international Universiade in Kazan, where the Russian chess team came second. According to Zangalis, the general public has lost interest in chess, largely due to lack of media coverage of the sport. In the 1950s-1980s, the USSR published a number of magazines of international renown, including titles such as 64, Chess in the USSR, Riga Chess, and others. However, the Russian Chess Federation is now trying to get the media interested in covering the sport. One such example is the Rossiyskaya Gazeta newspaper (RBTH’s publisher), for which Sergey Karjakin acts as an expert contributor; as well as the Kommersant, Moskovsky Komsomolets, Sport-Express and other national newspapers. Yet these breakthroughs in coverage have been achieved only in the past two years. The main challenge for chess is to get on TV screens. So far, there is only one regular TV program devoted to chess, which is broadcast on the NTV Plus satellite channel. The new board of trustees at the Russian Chess Federation hopes to change the situation in the near future. "I think, the main problem is that the previous generation, who used to follow chess, are largely gone, while the modern audience live in a market economy, where a TV picture decides everything," says Sergei Rublevsky, head coach of the Russian women’s chess team. He believes that it will take many years to revive the previous interest in chess among modern audiences. Lack of public and media interest results in reduced sponsorship, as chess is mainly supported by patrons. Therefore Russian chess players are faced with a choice: to join a risky sport, where competition for places on the national team, and therefore for funding, is very fierce, or to continue one's education and get a job, which may not be in sport but is at least stable and allows one to pay the bills. "One should realize that sport always demands sacrifices, be it chess or football. If a chess player has confidence and has talent, it is worth taking the risk. However, only players at the top of the ratings have a stable income," grandmaster Sergey Karjakin told RBTH. 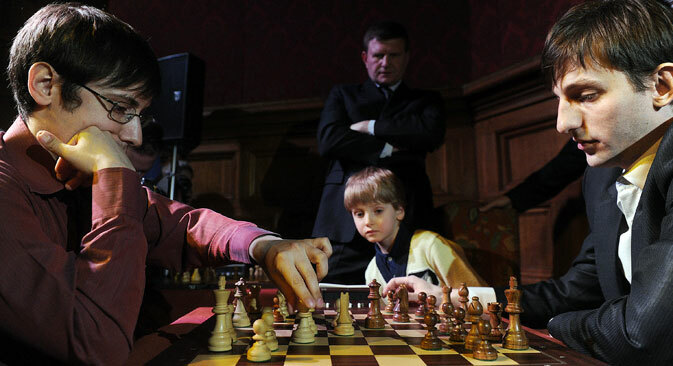 The Russian authorities are trying to improve the prospects of the sport by investing in chess training for children. Every year, the Russian Chess Federation, together with the Sports Ministry, allocates grants for talented young players, so they do not have difficulties with funding. According to Mark Glukhovsky, chairman of the board of the Russian Chess Federation, sponsors also prefer to invest in children. Since chess is a sport that does not incur huge costs, all the expenses are transparent: Money is spent on coaches, on entry fees or on grants for players. Perhaps with the benefit of this renewed focus on the sport, this new generation will prove capable of returning Russia to the pinnacle of world chess. The Russian national female chess team will not be permitted to participate in the Chess Olympics that will be held in the Norwegian city ofTromsø between August 1 and 15. The committee based its decision, which was announced on the official site of the tournament's organizational committee, on the fact that, according to tournament rules, countries wishing to enroll their teams should have applied no later than June 1. The Russian Chess Federation has not denying this, though the reasons for the delay have not been officially announced. Russian newspaper Kommersant cites anonymous sources as saying that the incident occurred as a result of the change of Grandmaster Yekaterina Lagno's declared citizenship for competition from Ukrainian to Russian. The process lasted until July 11.